Mark David Chapman is imprisoned for the December 8, 1980, slaying of John Lennon. 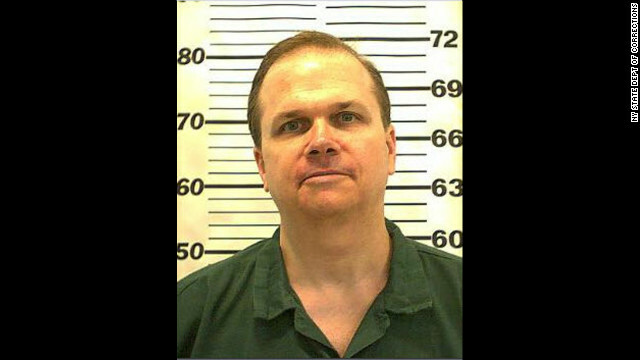 New York (CNN) -- Mark David Chapman, John Lennon's convicted killer, will get his seventh shot at parole in a hearing that could take place as early as Wednesday. His latest quest for freedom comes ahead of the 32nd anniversary of the death of the former Beatle, a British singer-songwriter who was gunned down outside his Manhattan apartment on December 8, 1980. Chapman is scheduled to be interviewed by two or three members of the parole board, according to Carole Claren-Weaver, a spokeswoman for the New York Department of Corrections. He was last up for parole in 2010, but was denied because his "discretionary release remains inappropriate at this time and incompatible with the welfare of the community," according to the New York State Division of Parole. He was also denied parole in 2000, 2002, 2004, 2006 and 2008. Chapman, 57, is serving a sentence of 20 years to life in prison, and is being held at the Wende Correctional Facility in Alden, New York. He is in protective custody in a single-person cell, Claren-Weaver said, and is allowed out three hours per day. Since his transfer from Attica earlier this year, Chapman has reapplied to participate in a state program called "family reunion," which allows inmates to spend more time with family members. Chapman has not had an infraction since 1994. It is not clear if he currently has legal representation. Yoko Ono, Lennon's widow, in previous years has submitted a letter requesting that parole be denied. Her attorney reiterated her position in an email to CNN over the weekend.